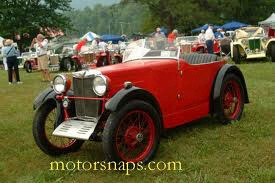 The MG M-type was produced by the MG Car company from April 1929 to 1932. It was sometimes referred to as the 8/33. Launched at the 1928 London Motor Show when the sales of the larger MG saloons was faultering because of the economic climate, the small car brought MG ownership to a new sector of the market and probably saved the company. Early cars were made in the Cowley factory, but from 1930 production had transferred to Abingdon. This 2 door sports car used an updated version of the four-cylinder bevel-gear driven overhead camshaft engine used in the 1928 Morris Minor and Wolseley 10 with a single SU carburettor giving 20 bhp (15 kW) at 4000 rpm. Drive was to the rear wheels through a three speed non-synchromesh gearbox. The chassis was based on the one used in the 1928 Morris Minor with lowered suspension using half elliptic springs and Hartford friction shock absorbers with rigid front and rear axles and bolt on wire wheels. The car had a wheelbase of 78 inches (1980 mm) and a track of 42 inches (1067 mm). 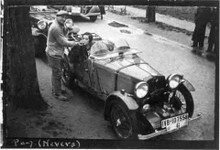 1930 brought a series of improvements to the car. The Morris rod brake system, with the handbrake working on the transmission, was replaced a cable system with cross shaft coupled to the handbrake and the transmission brake deleted. Engine output was increased to 27 bhp (20 kW) by improving the camshaft and a four speed gearbox was offered as an option. The doors became front hinged. A supercharged version could be ordered from 1932 raising the top speed to 80 mph (130 km/h). Early bodies were fabric covered using a wood frame, this changed to all metal in 1931. 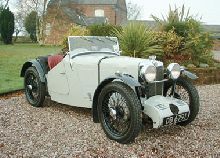 Most cars had bodies made by Carbodies of Coventry and fitted by MG in either open two seat or closed two door "Sportsmans" coupé versions but some chassis were supplied to external coachbuilders such as Jarvis. The factory even made a van version as a service vehicle. The car could reach 65 mph (105 km/h) and return 40 miles per gallon. The open version cost £175 at launch, soon rising to £185, and the coupé cost £245. The 1932 supercharged car cost £250. The M-type had considerable sporting success both privately and with official teams winning gold medals in the 1929 Land's End Trial and class wins in the 1930 "Double Twelve" race at Brooklands. An entry was also made in the 1930 Le Mans 24 hour but neither of the two cars finished.